Chutneys make a delicious accompaniment with idlis, dosas ,puris, and meals. 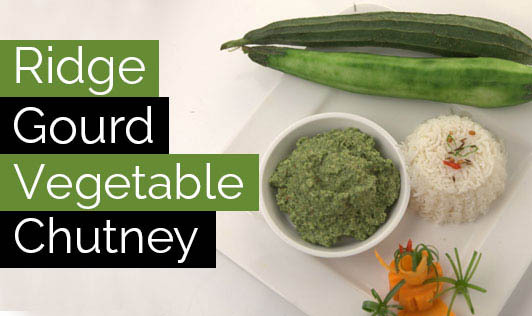 Ridge gourd chutney is a unique and delicious way of including ridge gourd in your diet. After trying this recipe, you would surely like to experiment with different vegetables and come up with your very own unique chutney. Heat a nonstick dish (kadai), add 2 teaspoons of oil and the ridge gourd. Sauté on medium flame for 2 minutes and keep aside. For the tempering, add 1 teaspoon of oil to the nonstick utensil and add mustard seeds. When the seeds begin to splutter, add channa and urad dal, hing, and red chilies. Sauté on a medium flame for 2 minutes, while stirring continuously. Add the tempering to the ridge gourd mixture and stir well. Add coriander, tamarind, coconut, salt, and ¼ cup of water, and blend in a mixer to make a smooth paste. Store in an airtight container and refrigerate and use as and when required.